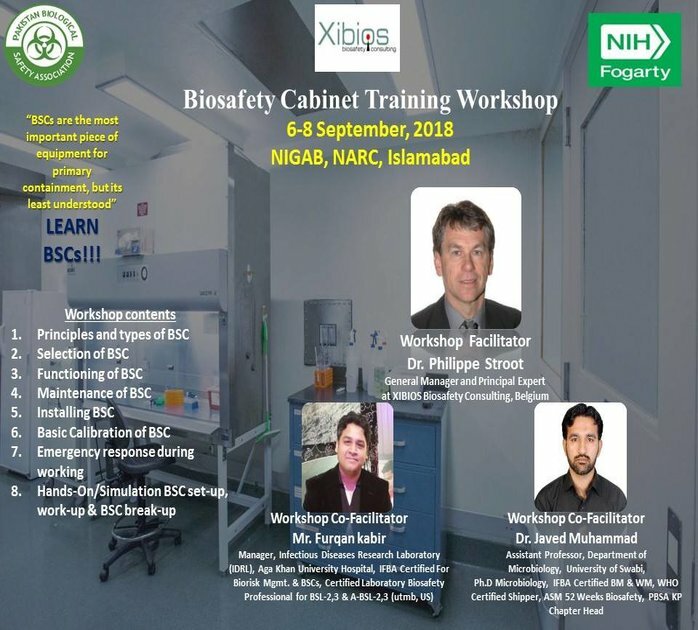 The Biosafety Cabinet Training Workshop being held at NARC, Islamabad will be a hands on training workshop on biosafety cabinets and how they can be used effectively for your safety and for your environment. The workshop will consist of differen contents mainly on principles and types of BSC, maintenance of BSC, installation of BSC, hands on simulation of a BSC setup and much more. The workshop facilitator will be Dr. Philippe Stroot who is the General Manager and Principal Expert at XIBIOS Biosafety Consulting. He will be joined by Mr. Furqan Kabir, Manager, Infectious Diseases Research Laboratory and Dr. Javed Muhammad, Assistant Professor of Department of Microbiology, University of Swabi. PBSA is looking forward to this workshop!